I was forced to get a regular job a year ago. Because of the hours of the job and the long commute to and from work, I was not able to actually do any art work for the entire time I was employed there. Last Friday was my last day. So, I once again have time to get back into the things that I so love doing. 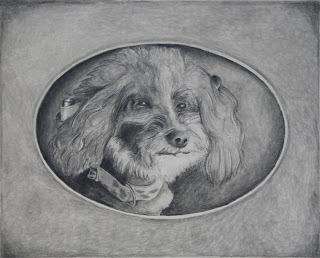 A friend of ours asked me to do a portrait of her poodle. I have to admit that I was a bit nervous about the work. I have never done animals before and the prospect of drawing a poodle with lots of curly hair was a bit daunting. But I bit the bullet this morning and dove into it. I am rather pleased with the results, however, as the artist I see lots of room for improvement. The good news is I learned a great deal. Everyone, meet Sydney. It has taken a while for me to get this lesson posted. The reason is that this topic was not as easy to write about as I had originally thought. I have taught this lesson many times in the past, but it was always when I was actually talking to people and I could show them things and let them ask questions. Doing this lesson in writing was a challenge. There are so many different things that I could talk about that it was very difficult to decide what to include and how best to present it. If you have any questions or would like to add to the concepts that I have discussed here, please leave a comment. The human brain is an absolutely fascinating organ. Science has yet to even touch the surface of understanding is capabilities. One of the most incredible things it does is cause us to see things that aren’t really there. If something is missing and our brains think it should be there, then it will make it up for us so that we can see it. 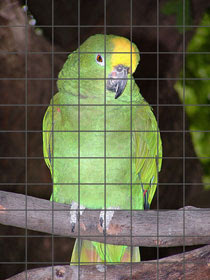 This optical illusion is an example. How many circles are here? How many triangles do you see? The truth of the matter is that there are no circles and there are no triangles. The brain doesn’t like a void so it tries to fill in the empty space with what it thinks should be there, in this case, it forces us to see a triangle that does not exist covering up parts of three circles and another triangle. 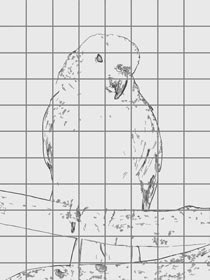 But when examined for what it really is you can see that the drawing really consists of three lines bent into sharp angles and three shapes that resemble pie charts. This optical illusion demonstrates two very important points about art. The first point is that art itself is an optical illusion. Your job as an artist is to create an image that will cause the viewers' brains to fill in the gaps and make something complete. You are not working in three dimensions; you are working in two dimensions. But when the viewers of your art look at it, their brains will force them to see all three. They will not see the fact that what you have actually done is take a nice clean piece of paper and creatively spread dirt all over it. They will see actual objects. The second point that the illusion demonstrates is that we don’t always see what we think we are seeing. That is the big issue here. If you want to create the illusion for your viewers then you must be able to see the reality behind all things, not just what your own brain tells you exists. 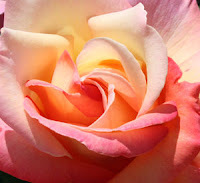 Take a look at this rose. At first blush you would think that it is pink. Because of that you might want to draw or paint it pink. 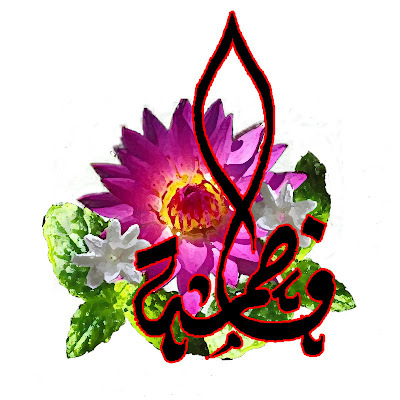 But look closer and you will see that it is filled with many shades of pinks, yellows, oranges, lavenders and white. I used Photoshop to separate some of these colors to make it easier to see, but if you are painting or drawing from a live subject you will not have the luxury of a computer. You will have to be able to see all of these colors directly in the object you are looking at. Look closely at your subjects and analyze them. Everything you need to draw them is right there, don’t let your brain convince you that you are seeing something else. Did you know that you do not see objects? If you look at a car driving down the street or your best friend sitting across from you at the coffee shop, you aren’t really seeing them. What you are seeing is the light that is reflected off of them. Eyes process light. It isn’t until we touch an object that we actually experience the object itself. This is a very important concept to keep in mind when you are drawing. If you try to draw an object then your brain will try to force you to draw that object they way it thinks that object should be. If instead you focus on drawing light and shadow, you will have much better results. Take a look at this billiard ball. Instead of looking at the object, let’s look at the light. There are three types of light that I want to point out here: highlight, shadow and reflective light. All three of these types of light are very important in creating photo-realistic drawings. The highlight is going to be the lightest part of your image. This is where the most intense light reflects off of the object. The light you are seeing here is a reflection of the flash from my camera. Never skimp on the highlight but don’t overdo it either. Try to recreate the highlight exactly the way you see it in the original image. The shadow is always the direct result of the source light. Keep that in mind when drawing. Shadows are simply areas of less light because there is either something blocking the source light or the area is farther away from the source light. Most people fully understand highlight and shadow, but the true magic of light comes from reflective light. Reflective light is the light that bounces off of other objects and reflects off of your subject. 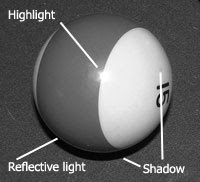 In the example of the billiard ball, the flash of my camera bounced off of the felt of the pool table and is then reflected off of the underside of the subject. Recognizing reflective light is very important. You see it everywhere, but your brain tries to block it out. In many cases, subjects have such a reflective surface that reflective light is defined to the point that you can actually see other objects reflected from your subject. If you want to take your art work to serious levels of realism, you must learn to see those reflections and include them in your final piece. My original thought in creating this blog was solely for the purpose of the lessons. But I have quickly come to realize that there are more things regarding art that I want to talk about than just the lessons. So, in the future, keep your eye out for the lessons, but I also hope you will enjoy the interludes in between. The first thing I want to talk about is selecting the right tools for this technique. Every project requires its own tools. You wouldn't replace the drywall in your house with automotive tools. You would want to make sure you had exactly the right tools to get exactly the results you wanted. The world of art is no different. 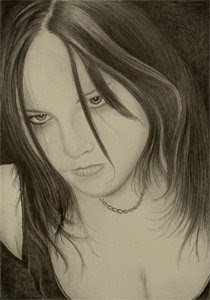 This image is of a portrait that I did for a very close friend of mine in Texas. She is a beautiful young woman with a wonderful soul. I worked from a photograph, but I also tried to capture the elements of her personality that I have come to know and love. That brings me to the first tool that you strive to acquire: an intimate knowledge of your subject. I have worked from photos of celebrities and have been able to duplicate the photos fairly well, but I do not know those celebrities. I have never spent time around them and learned what makes them laugh and what makes them cry. So, I was not able to capture the essence of the subject. When I did this portrait of Sarah, what I knew of her personality came through. When I looked at the finished work, I realized that it looked more like her than the original photo did. You will not get very far without a pencil, and it is very important that you choose the right pencils for your project. Graphite pencils are numbered from 9H to 9B. This determines the hardness of the pencil lead, with 9H being the hardest and 9B being the softest. The harder the lead, the more precise detail you can achieve, but you will end up with lighter images. The softer leads will produce rich dark tones, but you will not get the fine detail that you may be wanting. At some point you will want to invest in a full set of pencils and use multiple pencils in each drawing. But for our purposes in this blog, we will be focusing on a 2B. Don't skimp out! This tool and your paper are the two most important items that you will be using. Go ahead and splurge the $1.25 that it takes to purchase a good one. 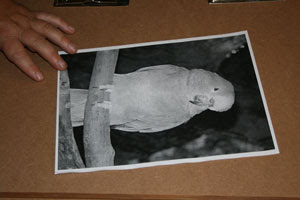 There are way too may aspects of paper to even begin touching the surface in this blog. What I want to focus on is quality and finish. There are two primary finishes that you will want to work with at first: Cold Press and Hot Press. Cold press paper is created by forcing the paper between two cold cylinders. The result is a paper with a bit of a texture to it. Hot press is just the opposite. The cylinders are hot, resulting in a much smoother finish. There are pros and cons to both of them but this is the basic gist. Cold press, or textured, paper will pull more graphite from your pencil resulting in darker and richer tones. However, the down side is that you will not be able to get the same detail that you can get from the smooth surface of a hot pressed paper. I prefer to get as much detail as I can. Therefore I use a hot press. As you begin working with the medium you will decide for yourself what works best for each project. Now I want to talk about quality for a moment. A good quality paper will hold up very well. This technique is pretty brutal on the paper. A cheaper grade of paper will not hold up as well and you will end up with the paper fibers actually breaking apart and your paper starting to disintegrate. You can get a really good pad of paper for anywhere between $7 and $15. Spend the money. You will be happy that you did. For our purposes we will be using a nice 100 lb Bristol vellum. Everyone has their favorite erasers. Most artists use a kneaded eraser, many use a gum eraser, I use a click eraser. Yup, the white erasers that they sell in the school supply isle for $1.50. It works just fine for me. The benefit of a kneaded eraser is that you can knead it like play-do to create fine tip points to lift out graphite to create highlights. If you want to use one, by all means. They are wonderful for that purpose. I just never use them myself. 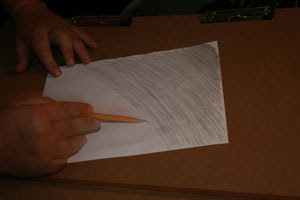 A tortillion is basically a tightly wound roll of paper that is used to blend graphite. It is actually the key to doing the style of art that we are discussing here. Without this tool, you will never get the smooth gradations of tone that you need to get a photo-realistic look. The good news is that this is the cheapest of all of your tools. You can usually get several in a package for around a dollar. What pencil sharpener you use is entirely your choice. Just keep in mind that you will want a nice sharp lead for most of the work that you are doing. So, don't skimp out too cheaply. That is about it for tools. 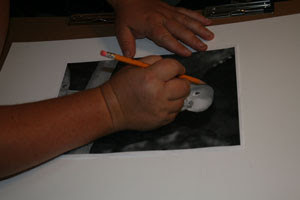 In our next discussion we will talk about different methods of getting an initial sketch of your subject. There are several ways you can make sure that your proportions are accurate and that your details are in exactly the right place.